This is an encouraging article on one of the nutritional uses of raw marijuana. It’s the first we’ve seen of the benefits of juicing the whole plant, but we expect more such stories to emerge in the coming years. There is certainly a great deal of evidence in favor of medical marijuana, but most times it is prescribed in a tincture or as a smokable. 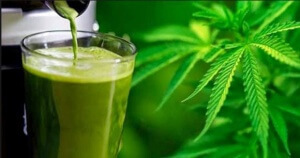 Juicing marijuana does not get people “high” and contains the full spectrum of the plant’s nutrition so it is suitable for anyone. One young woman, diagnosed with rheumatoid arthritis three years ago, was fed up with the side effects and ineffectiveness of the liver-destroying anti-rheumatic drugs her doctors were giving her so she decided to take matters into her own… blender. Katie Marsh’s daily relief is a smoothie with fruit, yogurt and thawed, juiced cannabis. After trying other natural anti-inflammatory remedies like turmeric and ginger, her pain continued to worsen and she became more and more debilitated. “It got so bad that I had trouble getting out of bed, getting off and on the toilet and even dressing myself,” according to a Fox News article. Upon a friend’s advice, Ms. Marsh decided to try juicing marijuana. She soon sought out Dr. William Courtney, co-founder of the International Cannabis Foundation a leading expert in raw dietary cannabis. “When it’s consumed as a leafy green vegetable, you get the whole profile of the plant,” said Dr. Courtney. Unlike heated forms of cannabis, raw dietary cannabis contains both the terpenes and chemical compounds in the correct portion and ratio. Some 8,000 of his patients, he says, have seen positive effects from ingesting raw dietary cannabis, whether juiced, blended, or chopped into coleslaw. According to Courtney, one of the biggest benefits is the positive effect cannabis has on the body’s endogenous cannabinoid system, which is made up of endocannabinoids, or chemical compounds found throughout the body that perform different processes. “I believe this plant, having evolved over millions of years, is put together to support that system,” he said. As for Katie Marsh, it’s working like a charm. Once she learned what strains to look for, she started juicing every day. “I saw results very quickly. Within a matter of a couple of days I was able to stop the prednisone and ibuprofen,” she said. Nearly a year later, Marsh still has slight pain in her feet from damage done by the rheumatoid arthritis, but her condition is now in remission.